Speaker at UM discusses new technology to combat fake news at event sponsored by Digital Media Studies minor. In an era of fake news, digital tools are being developed to combat its pernicious effects. 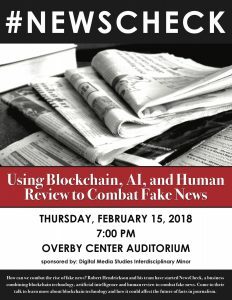 On Thursday, Feb. 15, 2018, NewsCheck Founder and Director Robert Hendrickson discussed his work dismantling fake news during his talk “Using Blockchain, AI and Human Review to Combat Fake News.” The event, which was sponsored by Digital Media Studies, was held in the Overby Center Auditorium. During his talk, Hendrickson explained that NewsCheck verifies the validity of news stories by ranking content against contrary facts and producing a score for the content. Blockchain then protects the content that has been checked against tampering, thereby preventing such mischief as the doctoring of headlines, news banners, or other information. Hendrickson was joined by Newscheck employees Pat Migliaccio, Bill Hendrickson, and Marykate Schneider. Robert Cummings, executive director of academic innovation and associate professor of writing and rhetoric, invited Hendrickson to campus to share his expertise on combating fake news, which Cummings says “is an existential threat to journalism and public relations, and of interest to students in those fields.” During their visit the Newscheck team was able to make visits to classrooms in Digital Media Studies and Journalism and New Media at the Meek School of Journalism and New Media, as well as meet with faculty from across the campus, including computer science.